Comes with 1/4" slider AND a free gripper only from Brooms Up! Velocity features a top-of-the-line 1/4" Teflon slider. 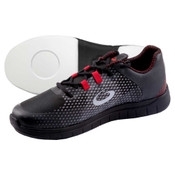 Curling shoes rated as Speed 10 to maximize sliding speed out of the hack, reducing leg stress and make easier to achieve precision during play.